When I arrived in Switzerland the first time, I expected to find snow-capped mountains, crystal clear lakes and Tidy Towns. It would surprise no one if I said that is precisely what we found when we arrived in Lausanne, but probably many would do If I told you here, just outside the city, the landscape is characterized by rolling terraced hills sloping down to the lake, covered by kilometers and kilometers of vineyards. A succession of hilly profiles sculpted and shaped by man, along which hundreds of stone walls, paths and steps intertwine outlining one of the finest artificial landscapes that have ever been created, in the continuation of what nature had begun. On the other hand, the imposing white peaks of the Alps. In between, a huge body of water that is often confused with the sky giving a thousand shades of blue. A landscape that still has the ability to keep me with my nose sticked to the window. I looked at this part of Switzerland in the middle of summer, at sunset, when everything was green and lush, with the warm colors of autumn, with the mist that confused the horizon, the grapes ripen, the vines with no leaves, all covered snow and I realized that the magic of a place can not know the seasons. 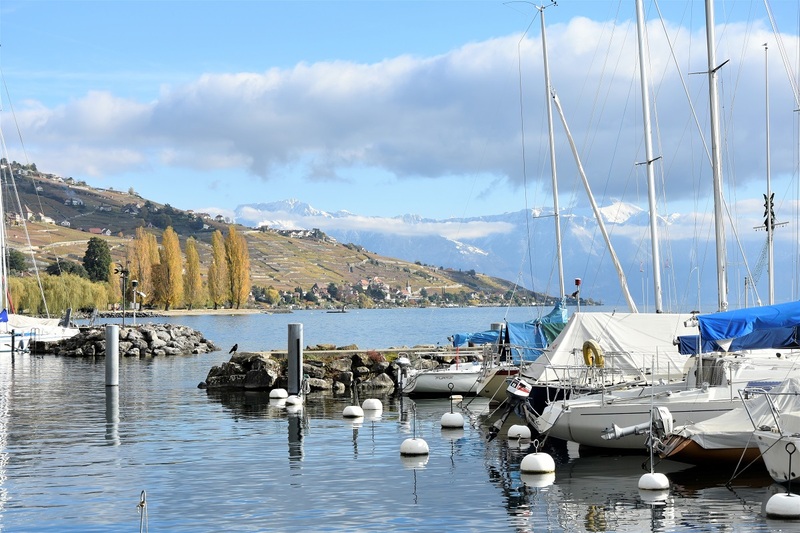 This area of French-speaking Switzerland, between Lausanne and Montreux, is known by the name of Lavaux. 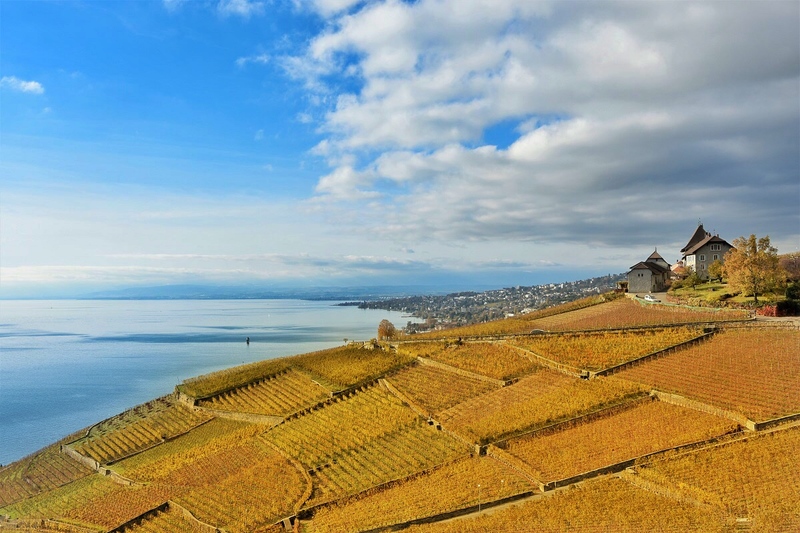 It ‘a wine region that covers 800 hectares and extends for 30 kilometers along the coast of Lake Geneva. The wine here, contrary to what one might think, is an ancient tradition. The first plantations date back to Roman times, but it was the Benedictine monks in the 11th century to bring the highest levels of production, striving to create the terraces to reduce the slope, in order to exploit fully the surface, channeling rainwater and curb soil erosion. Since then, the wine tradition is been passed from generation to generation, but the culture techniques are roughly remained the same. The steepness of the territory does not allow the use of the machines and harvesting is still done by hand: the growers use small cable cars for the transport of materials and during the harvest are attached roped on steep sides, as the experienced climbers. 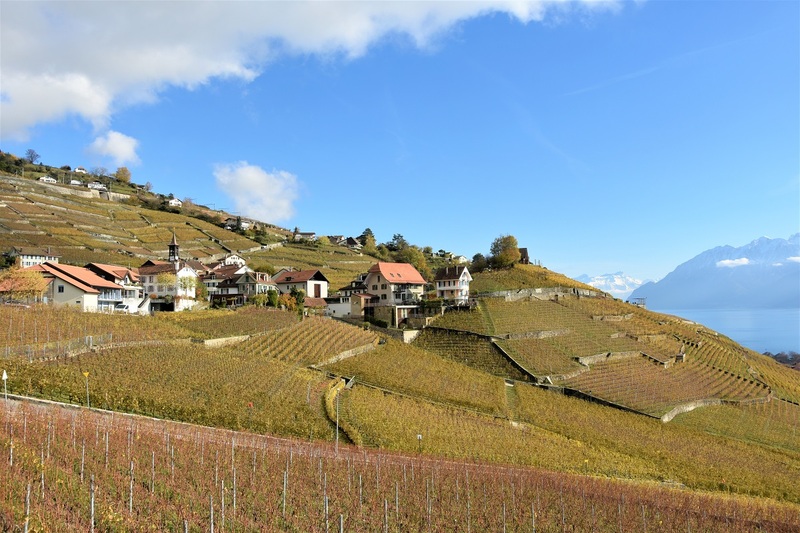 Today in Lavaux are some of the steepest vineyards in the world: there are 10,000 terraces of 40 levels, supported by some 400 kilometers of stone walls. Mondovino teaches me that the main grape of the region is the Chasselas and wines produced from grapes Lavaux echo the name of the villages near which grew as Epesses, Lutry, St-Saphorin and Vevey-Montreux. The climate of this area is considered Mediterranean, mitigating the influence of the immense Lake Geneva, but despite this is not the coldest part of the Confederation, when the wind blows from the Jura mountains, the wind that the Geneva affectionately call bise – kiss – and I fear more than any other weather event, whatever risks around freezing. 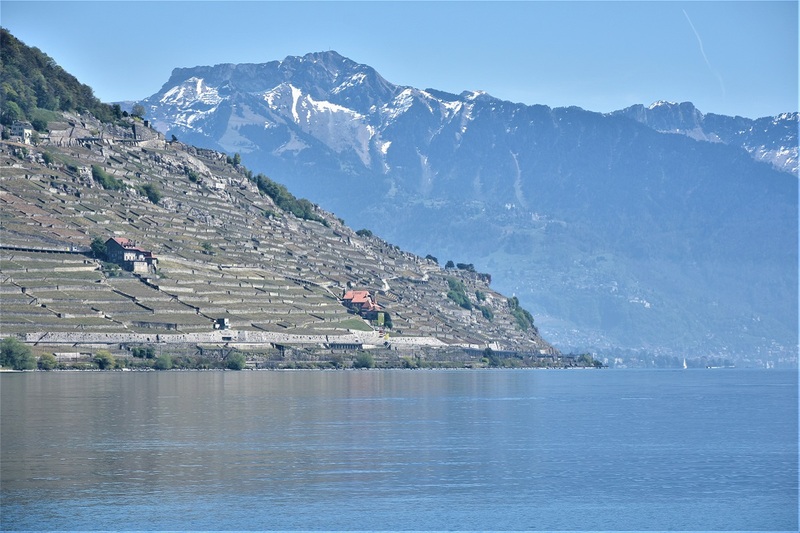 The grapes growing along the slopes of Lavaux, however, benefits from a phenomenon of only three : the sun’s rays through exposure to the south, the reverberation of the same in the lake water and heat release of stone walls protecting it cold allowing it to mature slowly. 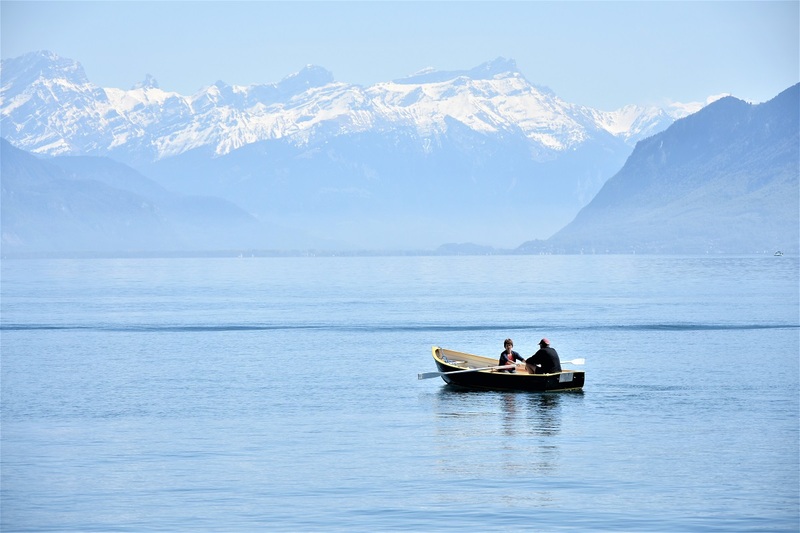 There are several ways to visit the area: the simplest is to move from one village to another, from Pully to Saint-Saphorin , for example by following the Route du Lac [9 road, not to be confused with the A9] in car. In this regard, I have not even got to visit them all, but I can say that the historical center of Lutry (photo below) I loved it and landing stage view of Cully (3rd and 4th photo) is simply spectacular. But it would be a shame to spend too much time in the car, which means among other things poorly suited bucolic atmosphere of the place and the most well-liked around here kind of tourism. The fact is perfect for a walk along one of several chemin that wind through vineyards, thanks to which you feel completely immersed in the landscape, enjoying the best view ever. Between Lausanne-Ouchy and the Castle of Chillon are 7 marked circuits covering a 32 km radius. If, however, the intention is to simply make four steps to take beautiful photos, the Chemin du Dezaley , including the Clos des Moines and the Clos des Abbayes, both ancient cellars originally owned by the monks, is probably one of the most characteristic. 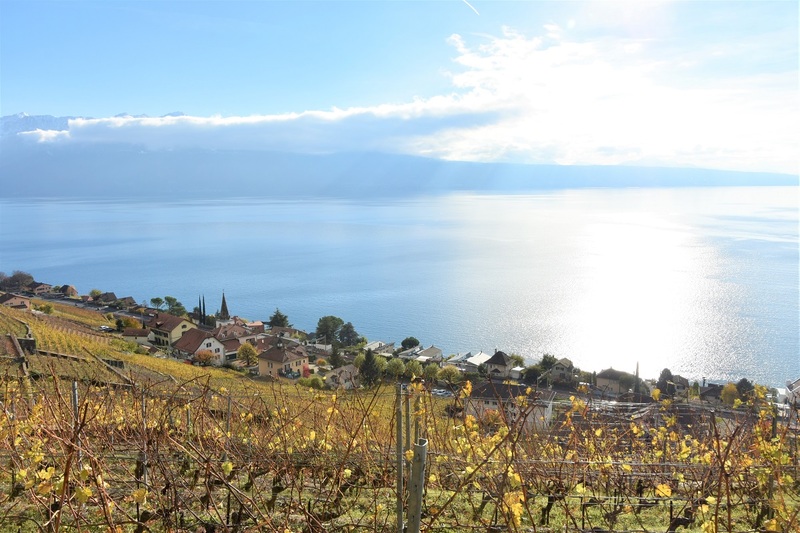 Another alternative, limited to the summer, the scenic train is certainly the ideal means if you decide to visit the wineries scattered among the terraces: the Lavaux Express and Lavaux Panoramic can also choose different thematic tours. For walking and biking tours and the list of visitable cellars you can have a look at sito di Lausanne Tourisme.